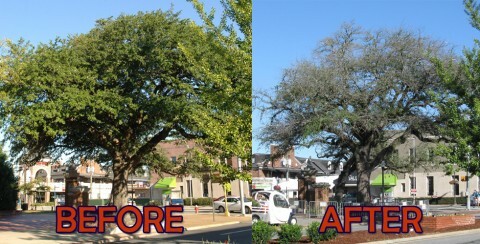 Auburn University recently released “Before and After” pictures of the Toomer’s Oaks that speak 2,000 depressing words. The date of the “Before” photo isn’t specified, but it’s obviously before Bama fan Harvey Updyke claimed he poisoned them. The “After” shot was taken in mid-October. According to the Toomer’s Task Force, whether the trees produce new growth in the spring will best determine their chances of survival. Related: Auburn fans start “Unrolling Toomer’s” tradition. / Did Auburn students celebrate Bear Bryant’s death by rolling Toomer’s Corner? Anyone know when the building in the right background was painted? Can’t remember what it’s called now…Bodega’s maybe? Those places change names so much. I figured whenever the name changed recently it got that paint job, but not necessarily. The chance of survival for these trees has already been determined. There is none. Sad, but true. Anyone saying anything other than that is dealing in hope with no basis.